As one of the upwardly mobile metropolises of India, Chennai has come a long way from the sleepy city it used to be. The city bustles with activity and is an important manufacturing and commercial hub,not just in the southern part of the country but also in the entire South East Asian region. Chennai city is well connected to the rest of the state and country by the railway network. 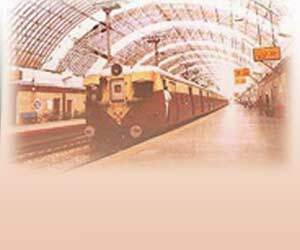 Chennai Central and Egmore serve as important railway termini for broad gauge and meter gauge trains. There are direct train services to other important cities such as New Delhi, Mumbai, Kolkata, as well as distant destinations such as Jammu, Lucknow, Chandigarh and Guwahati. Madras city has an extensive suburban railway system that is well patronized. The suburban railway transportation in Chennai connects Chennai Central to Ennore, Avadi and Tambaram. The MRTS (Mass Rapid Transport System) is the new addition to the transport options in the Chennai. Commuters can take the route from Chennai Beach to Thiruvanmiyur in South Chennai or the Tambaram line. This system is aimed at relieving the congestion on the bus system, which is already under severe strain, especially during peak hours. Thiruvalluvar Transport Corporation Limited is the bus company that serves the needs of the people of Tamil Nadu. This bus company has been bifurcated into other sub-divisions for ease of administration. The Central Mofussil Bus Terminus (CMBT) at Koyambedu is the largest bus terminus in South Asia. Other than the State run buses, there are various private bus fleet services that operate to cities such as Coimbatore, Madurai, Trichy, Tirupathy, Salem and Bangalore. You can find comfortable air-conditioned buses to many destinations. Chennai MTC (Metropolitan Transport Corporation) provides a bus network across the city - one that is frequent and affordable. With its vantage location in the south of the country and proximity to economical hubs of South-East Asia, Chennai airport is a vital link in the air routes of the region. The domestic and international airports at Meenambakkam are host to several flights within the country as well as international destinations. Most major international airlines have direct regular flights to Madras. The ubiquitous auto rickshaw is a popular form of transport within Madras city. Your skills in haggling and bargaining can be put to the test when dealing with the auto drivers. Prepaid taxis can be hired from the railway station or airport. The newer entrants on the scene are the 'call taxis'. They are just a phone call away, and can be relied upon for prompt service, albeit at a slightly higher cost. Private cars can be hired for trips within the city and outlying places. But over the years, the growing menace of reckless driving, scant regard for road discipline and increasing accidents has made travel within the city a nightmare. Chennai has the dubious distinction of extremely high road accidents vis-à-vis other cities.